When I was growing up polio epidemics were frequent. I lived in a small upstate NY town known for its beautiful mountains, cool stream waters and great summer weather making it the perfect vacation escape for thousands of people. Combine the time and the place and families were careful to shield the children from this crush of visitors. We were lucky that my grandparents owned property up in those mountains and every year our family left our hometown the day after school recessed for our summer place, returning the day before school started. I remember eagerly packing the old station wagon with summer clothing, bathing suits, as many books as I could fit and games. Those summers were bliss. Acres of property to run and play, forts to build, mountains to climb and brooks to wade. Although I was the only child around I never got lonely – too much to do, so much to explore. My sister was a baby but eventually,over the years we spent on this summer trek, grew into a fun, if sometimes a pesky playmate. In the evening we would go for walks to watch the sun go down, catch fireflies, read, play Uncle Wiggly or listen to the radio or get my grandmother to tell us stories about life in Scotland. These years, life was a blank canvas filled with experiences and we were willing sponges. I learned the names of birds and trees, devised games to amuse myself, read my way through all the Bobbsey Twins, Cherry Ames, Nancy Drew, Pollyanna, and too many others to name, learned to swim, learned to enjoy being myself. And then there were our only near neighbors, just a short walk up the hill. They lived here all year round, farming the land, haying, milking the many cows that grazed on the hillside. She was what they used to call a maiden lady, never married, and the owner of the old house filled with antiques, mostly china and books. She opened a new world of authors to me: Gene Stratton Porter, Albert Payson Terhune, Readers Digest Condensed book. I still have all she gave me each summer and enjoy remembering and re-reading even today. My secret wish was to go to Mackinaw Island and meet Freckles so he could teach me more about moths and butterflies and then I would marry him. Her border, was an elderly man, blinded and scarred years earlier in a chemical fire. Born in Ireland he had the greatest Irish brogue – sometimes we had to guess what he said. He was jovial, friendly and fun to be around. He would take us into the barns with the cows, let us play with his dog and was always laughing. We learned about Belleek China, drank watery tea from those cups, ate cookies, listened to stories and tried on old hats. It was an odd tea party but oh so delightful. These years went on for a long time but then in the mid-50’s things changed. The reason for leaving our hometown – the chance of contracting polio, was no longer a threat. First the Salk vaccine and then the Sabin oral vaccine and polio epidemics died down and then out. Although we still continued to go to our summer place we were not so isolated and eventually we only drove up for long weekends. 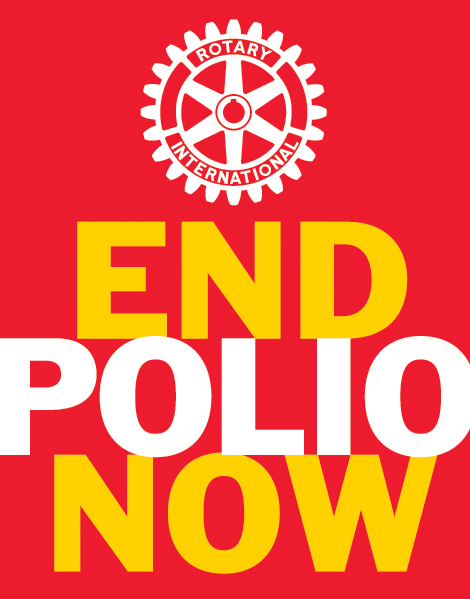 I learned many years later that members of Rotary International made a promise to the children of the world to eradicate polio. Now most of the world is polio-free with a final push to finish what was promised over 30 years ago. I joined Rotary in 1997 and do my part in the eradication effort. From-time-to-time I think about those summers, all the experiences and adventures, the life skills learned, the passion for literacy, the habits of mind and realize that if it hadn’t been for the polio scare my life might have turned out very differently. I still visit that summer place the land now owned by others. Our neighbors long gone, the barns in neglect. But the trail down to the waterfall is still there, overgrown of course. The entrance to the pasture hidden by encroaching trees and maybe I’m the only one who remembers where the secret mountain spring is located. And I will see Rotary keep its promise.